Yanno, I made pot roast the other day. That Old Lipton Onion Soup Pot Roast from the ’60’s. And I saved a bit for my Bourbon Barbecue Pot Roast Sandwich. It wasn’t easy, and it took a heroic effort to squirrel a little away for this sandwich, but when a sandwich so epic can be made from a few leftovers? So worth it. Besides, if you’ve ever had leftover Pot Roast (and this sandwich can be made from any leftover pot roast) it’s good, not necessarily thrilling. When pot roast gets cold it kind of solidifies a bit and has to be reheated “just so”. In the old days, I’d just dice it up and serve it over potatoes or bread with some gravy, just like my mom did, but no more! It was time for some serious leftover game, and this Bourbon Barbecue Pot Roast Sandwich qualifies. A while back a couple blogging buddies and I were involved in a Link Party. A link party is when a blogger or a group of bloggers get together and provide a space for everyone to link up a photo and a recipe so you can see up to hundreds of recipes on one page. (I often link up to Fiesta Friday, link below.) One of the bloggers in our group was Alli, from Tornado Alli, another Minnesota blogger! I’ve never forgotten her Bourbon Bacon Meatloaf Sandwich! And I based my Bourbon Barbecue Pot Roast Sandwich after her method. So check Alli out, you’ll love her site, and you’ll love her Bourbon Meatloaf Sandwich, too. So both our sandwiches have a caramelized Bourbon Barbecue Sauce, cheese and French fried onion rings. I didn’t use bacon as Alli did. I thought about it, but in the end, decided enough was enough, lol! You can add bacon if you want. I just happened to use my Sweet Bourbon Maple Barbecue Sauce because I had it in the fridge, but I loved Alli’s idea of doctoring up your fave bbq sauce with a smidge of bourbon. Just make sure it’s a good, thick, sweet & tangy kind of sauce. And I loved the way Alli let her meatloaf caramelize in that sauce so I did the same for my pot roast. First of all, when you make this sandwich use a large nonstick (not your best one) or an easy to clean well-seasoned cast iron pan or griddle. You’re going to toss in that barbecue sauce and let it get a little caramelized, even to the point of almost being burnt a bit on the edges and something like a stainless pan is not going to make you happy when clean up time comes! Then just as soon as that sauce has thickened and darkened a bit, turn the heat down, toss the chunks of pot roast in and gently turn them around a bit so it doesn’t break down but gently heats through. I kind of just nudge the pot roast into about four equal sized piles and top with cheese and then a lid so the cheese gets ooey-gooey. I like to use a thick slice or several hand-cut slices so the cheese is a substantial layer. When I make this sandwich, I cut and fry up those onion rings ahead of time, then brown up my buns so I can concentrate on the meat. It goes fast and I really had to pay attention to it. So really it’s all pretty easy peasy, just watch it carefully! I suggest using pickles = those briny pickles offset that sticky sweet smoky caramelized sauce to perfection! So this whole recipe is basically money saving, right, coz leftovers!! You can never go wrong with buying a larger cut of meat at a great price and serving it over two (or more) meals. You get to “cost average” the price. And while one meal might be heavier on the protein, and the subsequent meal a bit lighter, it doesn’t mean it can’t be just as delish or maybe even more so. I picked up the buns at Aldi, and you might even recognize them from a burger I posted a while back, my French Onion Soup Burgers. I had extra buns, so I tossed them in the freezer, thawed them overnight in the fridge. Once they were toasted, they were good as new. Another way to “refresh” past their prime buns is to wrap them in a damp (wet it and wring it out) paper towel or napkin and put them in the microwave for about 30 seconds. I served these burgers with my KFC Copycat Cole Slaw, recipe coming soon, and not shown in the pic with the burgers, American Fries from the leftover potatoes from the pot roast. If you have any! That recipe is coming soon, too. If not, leftover baked potatoes work so well and fry up beautifully, too. And you can’t go wrong with fries. Maybe my Stupid Simple French Fries, my Bomb Baked Potato Wedges or my Stupid Simple Crispy Sweet Potato Fries? So there ya go. Have I made you hungry for Pot Roast, yet? Add Barbecue sauce or Barbecue sauce & bourbon to a large skillet or griddle. Heat until hot and just beginning to caramelize on the edges. Stir and add the leftover pot roast and turn gently to coat. Continue to heat for a minute or two, watching heat level carefully, so the sauce caramelizes a bit. Take off heat, divide meat mixture into four piles, top with cheese and add a lid so the cheese melts. Place pickles on the bottom bun, scoop up a pile of the beef & cheese and add to bun. Top with the onion rings, the top bun and serve. 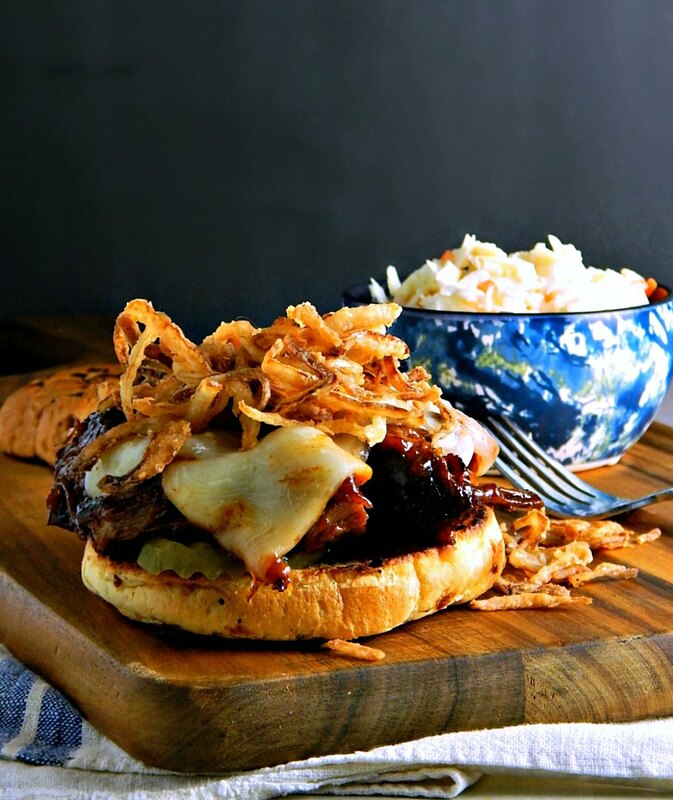 I’ll be sharing Bourbon Barbecue Pot Roast Sandwich at Fiesta Friday #242, cohosted this week by Jhuls @ The Not So Creative Cook and Jen @ Apply To Face Blog. You’re going to love all the bloggers that share their best recipes of the week at Fiesta Friday but do drop by and see Jhuls. You’re going to love each creative recipe and take sec to stop by and see Jen. She’s going to have you in stitches with a helping of her real-life stories along with each recipe. This entry was posted in Click here for Fabulous Food Posts and tagged Barbecue Sauce, Bargain Meal of the Week, bourbon, Cheese, leftover beef, onion rings, onions, Pot Roast, Sandwiches. Bookmark the permalink. Hi, and thanks! It is a messy and wonderful way to have leftovers, that’s for sure!! Everytime I come across this pic on my site I think I HAVE to make a pot roast, but not for the pot roast, for this! Mouth watering Mollie!!! I wonder could I use just sliced roast beef from the deli?? Who wouldn’t love this??! Absolutely! I loved that this was so easy and it is kind of trendy, too! Waw! This looks amazing! You come up with so many fab recipes that are all new to me! Thanks so much! And thanks for hosting for us too! This looks fantastic! And I’m psyched for your KFC copycat coleslaw recipe, I love that stuff! I do too! A friend and I ate at KFC not too long ago and I can’t remember the last time I was there! The coleslaw was the best part! I got a little distracted from my “master plan” on the pot roast with the Epic French Toast I’ve just made! Now, this is a burger! A perfect one, I must say!😁 Thank you for always sharing your awesome creations at Fiesta Friday party! I don’t even like bourbon but I love it in barbecue sauces and a few other recipes. I have a bottle for company but I keep getting into it for cooking! It’s definitely a great ingredient for depth of flavour. I’ve done my job then, lol!! Thanks, Jess! I thought as I made these that they are perfect “guy” food!